Winter Patriot: Did Terrorists Cause The Minneapolis Bridge Collapse? Did Terrorists Cause The Minneapolis Bridge Collapse? 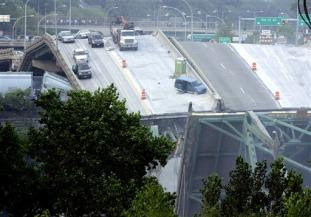 At least seven people were killed and another 60 injured when an eight-lane bridge collapsed into the Mississippi River during evening rush hour in Minneaopolis on Wednesday. Investigators haven't even arrived yet and already the speculation is rampant. Was it terrorism? metal failure? a design error? Everybody from here to Malaysia wants to know, sort of, especially since if it was a terrorist attack then that means war with Iran, and possibly even Pakistan, even if neither of these countries had anything to do with it. The mainstream media is giving us nothing to go by, saying things like "No hint of terrorism" and "Cause of collapse unknown". Fortunately we have history to guide us. The easiest way to tell whether or not this was a terrorist attack is to watch what happens to the wreckage. If the debris is not preserved for a forensic investigation but cut up and shipped off to be recycled instead, or even used to fill potholes, then the cause of the collapse is Islamo-Fascist terrorism, we should attack Iran and Pakistan immediately if not sooner, and Barack Obama is a genius. Otherwise we will have to wait a little longer to find out what happened and John McCain is right.